STOP PRESS AGAIN – INITIAL SKETCHES FOR A SAILING VERSION OF THIS BOAT CAN BE FOUND HERE. ALSO – IF YOU BUILD THIS BOAT OR A MODEL OF IT, PLEASE CONTACT ME AT GMATKIN@GMAIL.COM . I’M HAPPY TO OFFER HELP AND ADVICE, AND VERY MUCH WANT TO KNOW HOW THE PROJECT GOES! So tan-tara! 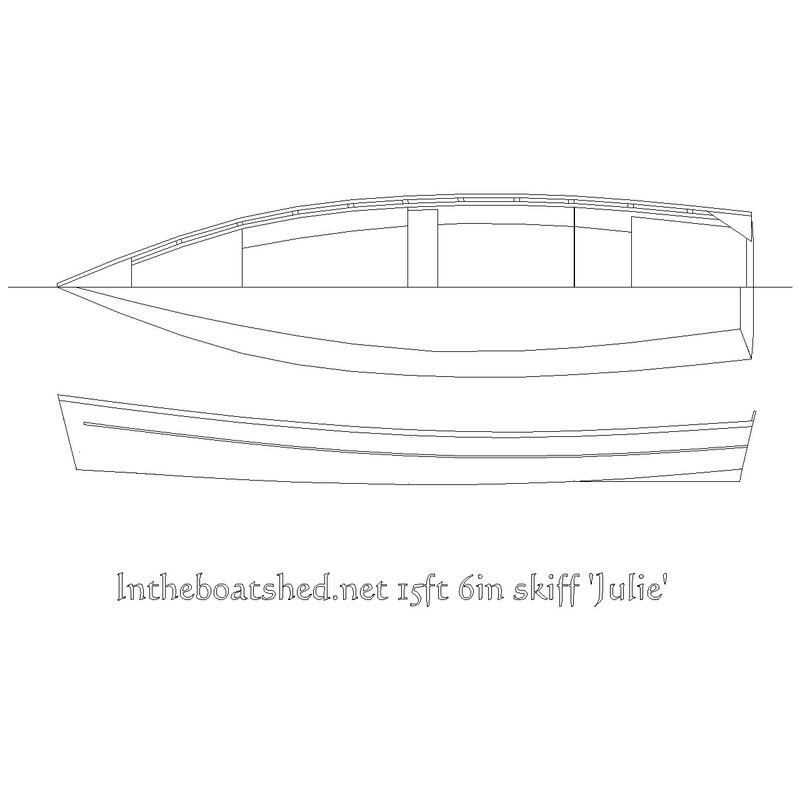 With an imaginary fanfare, tonight for the first time I offer you – a download of the finalised plans for the rowing-only version of the Julie 15ft 7in flat bottomed skiff for plywood stitch and glue construction, including my explanatory essay on her design and purpose, and notes on her construction. She swallows up five sheets of ply, and for those those who like to think about these things, at her design displacement and trimmed so that the water just kisses the transom, her wetted area is about 38sqft, with a prismatic coefficient of 0.55. Neither figure would be outstanding for a round-bottomed boat, but the wetted area in particular is not at all bad for a simple rowing boat like this. With a flat-bottomed skiff there’s no easy way to improve on either without making the boat much narrower on the bottom, with all that would entail. I think she’s a sweet little boat and I’m very much looking forward to seeing some examples afloat. I still plan to develop a sailing rig, plans for a more traditional chine-log style construction, and I’m thinking also of both longer and shorter versions – the shorter will be aimed at creating a small easy to build skiff capable of being built in a British-style garage. If you do build the Julie skiff, please send me photos and reports at gmatkin@gmail.com, and also please let me know how the project goes. At least while the numbers being built are small, if you hit problems I will be very happy to provide advice to make sure your boat is a success. If you’d prefer a smaller project of this kind, check the 12ft Ella skiff and the 14ft Sunny skiff. Do you expect to add dxf files of the nested parts to the zipped package? I consider those very very helpful. Happy to send you some Jaap – so long as you don't intend to use them for commercial purposes. PS – Jaap didn't, and I sent him the files. How much epoxy you use depends very much on how much you like to use. Here in the UK epoxy is terribly expensive, and we make our fillets about as wide as a table-spoon will form, use fairly light-glass on the bottoms of light boats and apply it fairly thinly everywhere else. On that basis, I guess I might use four-five litres. In other places epoxy is much cheaper, and in my observation some people tend to use it more generously, which of course produces a heavier if stronger boat. Others, however, may be looking for a lighter-weight boat, and so use less. I'm glad you enjoyed making the models. You couldn't let me have some photos of them I could put on the site could you please? I like to encourage model making, partly because it's fun, partly because it encourages confidence and partly because it helps people to see how the boats go together. I live on a river in the southern US, and have been looking for an inexpensive – relatively – way to get on the river. I hope to build a Julie skiff in the next few months. One question: you mentioned a sailing verion of the skiff. Do you have such a plan completed? I have considered building a small sailing craft, something simple to sail – for a novice. Haven't worked up the sailing version yet. Hopefully I don't have to say how useful the notes and the drawings are – otherwise the various components could confuse a person. The knees and breast hook will add to the rigidity, of course. I was looking for plans to build a "Chipewyan Skiff" and stumbled upon your beautiful ones instead. They appear very much like the native craft of that area, perhaps certain boat designs are fundamentally self-evident? Does anyone know the expected cost of producing this boat? Rich – thanks for your interest. To attempt to answer your question, you'll need the number of sheets of ply indicated, framing, gunwale and inwale timber where indicated (say, 100ft), several kilos of epoxy (how much depends on how liberal you are with it), maybe 100ft of 3-4in epoxy tape, glass cloth to cover the outside (you might cover only the bottom, in which case you'll need a piece about 16ft by 4in, or may prefer to cover the whole exterior). You'll then need one coat of primer, two coats of undercoat and two coats of paint all over. You'll need varnish two – six coats is normal for gunwales etc. In all it's difficult to say precisely because the total will depend on the qualities you buy, how you choose to build the boat and the cost of materials in your country. What I would say, however, is that there's no reason to think it would be any more expensive than other similar designs. Unfortunately I saw the another design of July skiff which 15 ft and 7 in and Ella skiff, may I do have them too for my considerations. I just started off with fishing and buying a boat is quite expensive. Then I decided to make one instead because I don't like to rent one just to go fishing with my son. I just have one question, are there any specific types of wood not to use? I just don't want to waste my money on something that is not going to work. Looking forward to your feedback. – OR exterior ply (if you can find some without voids), maybe polyurethane seams or cheap pine chine logs, and a quick and dirty job. What I don't advocate is a mixture of both! With so much appreciation for generosity, I thank you for that free downloads. I am going to use it to learn how to make boat with my 2 sons. will want make the Light Trow my project to build with the other members. Any thought to finishing the chine log version of this boat? I really prefer them to epoxy fillets. I like this boats dimensions, any idea what the prototype weighed? I will be comuting and need to beach it twice daily. How heavy these boats turn out to be varies with what builders put into them. A simple stitch and glue job built reasonably lightly is likely to come out at around 35lbs per sheet of ply. I haven’t got around to drawing the chine log version, I’m afraid, but it wouldn’t be difficult to do – cut out the panels and wrap them around a reinforced central thwart panel using the traditional skiff-building technique. I have convinced myself to give it a go without the plans. I like a boat to track well so I am thinking of adding a full length flat keel and maybe some sacrificial bilge keels to reduce the damage of running up on a ramp. I can pull about 100 pounds out of the water so I think I’ll be alright. Thanks for the plans, can’t wait to get started. In circumstances like that, yes I think some flat keels would be a good idea, though they will slow the boat slightly. I have rowed quite a few boats over the last 35 years. I know exactly what you are talking about, it never occurred to me that the skeg could be making the bow bury away from the wind. So is the issue that the skeg holds the stern straight in line with the effort of the oars and the bow breaks free instead of the whole boat moving, or is their something else going on? Printing the model on construction paper tomorrow. Will have my design pretty much worked out over the weekend. The skeg is needed to make the boat track – but if it’s big, when the boat’s side on to the wind you get the effect that the bows blows away down wind, turning the boat stern-to the wind. I’m delighted to hear that you’re building the boat by the way. Please contact me at gmatkin@gmail.com if you have any questions – I will be very happy to help with practical matters via my email account. Got the model done, will send photos tonight. Even more excited now that I have something to look at! Making a model is always a great start. I’d very pleased the magic of it has worked for you too! I was thinking of trying this in aluminum. I work at a metal fan shop and I have access to laser and water jet. I have been wanting a “skiff” style boat that I can build out of aluminum. A coworker built his johnboat and used mostly damaged or untraceable materials and only spent a total of $200. That’s what I what to do. But I like this design better than the Jon boat. What do you think? I was thinking of a model size first to see if I want to make any changes. It s hould work fine, as long as a skiff is what you want. It will row well, though not as well as a similar round-bottomed boat, but will only take a very small outboard – 2hp is the upper limit. I’d also say that deciding design changes on the basis of the model could get you into trouble – with a cheap, easily worked material, I’d suggest building the boat as drawn and getting experience with it before making changes. I just downloaded the Julie plans. The pictires are fine but there are two that won’t open. I assume they are the instructions. Is there a free program that wll open them? Hi Robert – it’s great to hear of your interest in my plans. As all but two files are either jpeg picture files or text files, I guess they are the ones you’re referring to. This is a nod towards open design and is for folks who either want to develop a new hull form of their own, or to study the Julie’s form.